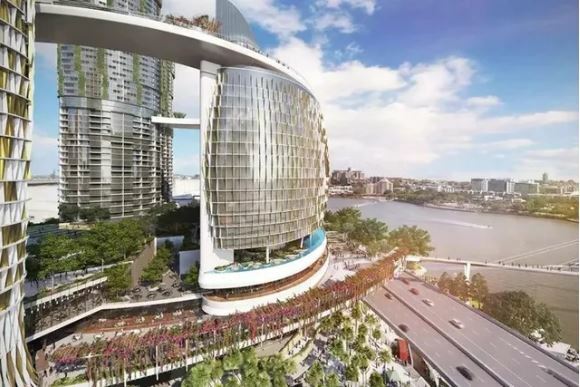 Construction on a massive wall that will require enough concrete to fill an Olympic-sized pool has commenced at the much-anticipated $3.9 billion Queens Wharf project in Brisbane. Described as a "engineering feat", the 172 metre concrete wall will create an underground barrier between the wharf and the Brisbane River. Known as the “diaphragm wall”, the barrier will dive 22 metres into the ground and will be the starting point for a five-storey basement carpark. Construction giant Probuild was awarded the excavation works package which began in early March. Probuild Queensland managing director Jeff Wellburn explained that the basement excavation is to support the future superstructure. It requires nearly a metre-thick concrete diaphragm wall to be constructed, which will embed into the rock five basement levels down from Queens Wharf Road, to hold the river back from the excavation,” Wellburn explained. Approximately 450,000 cubic metres of ground will be dug out over the course of the build. “We will use more than 2,500cu m of concrete, enough to fill an Olympic-sized swimming pool, to build the diaphragm wall,” Consortium project director Simon Crooks said. “The wall will have 28 panels running along the inside edge of Queens Wharf Road to Margaret Street to provide a watertight barrier. Meanwhile, Tourism Industry Development Minister Kate Jones said Thursday that the search for around 2,000 Queens Wharf workers will begin on Friday. “The Consortium will go live with an Industry Capability Network website, to capture what they expect will be thousands of varied expressions of interest to work-on and supply this massive, game-changing development. Brisbane’s first integrated cycle track at Northshore Hamilton.